7. 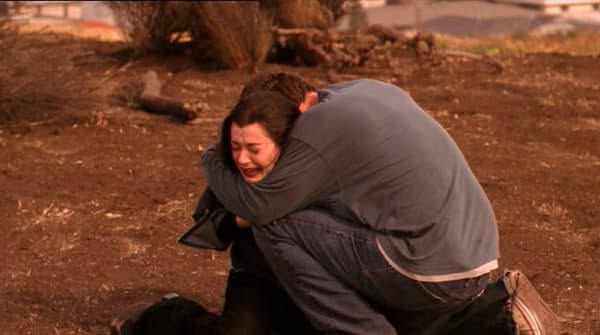 Buffy the Vampire Slayer Season 6 episode 8, "Tabula Rasa"
"Tabula Rasa" has always been my favorite episode of Buffy because it is both hilarious and heartbreaking. No matter how many times I watch it, I always find myself laughing out loud at the absurdity of it all. 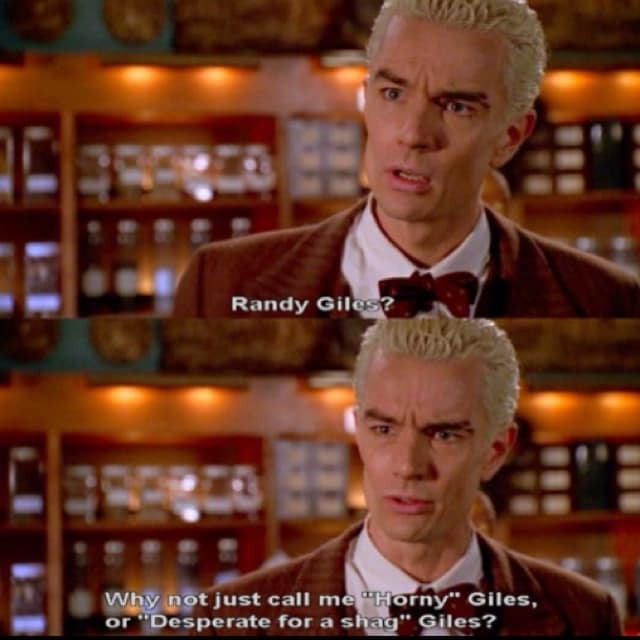 From Spike's "Why not just call me 'Horny Giles' or 'Desperate for a Shag Giles'?" to Anya filling the Magic Shop with loads of bunnies, it's pure comedic gold. Grief over Tara’s murder completely overwhelmed Willow who went on a magic bender for the ages. It culminated with her need for vengeance driving her to not only kill Warren but flay him alive. It seemed that no one could stop her magic rampage, not even the Slayer. So when the Buffy the Vampire Slayer season 6 finale opened, we really believed that Giles would be the person to get evil, angry Willow to see the light. Willow: Uh oh. Daddy's home...I'm in wicked trouble now. I’ve always loved Willow, but dark, sarcastic, drunk on power Willow was like nothing we’d ever seen! That sweet, smart, shy girl we’d met at the beginning of the series was nowhere in sight, but that’s exactly the Willow that Xander tried to reach as she stood on the verge of obliterating the world. Yes, we know that the pure magic that Willow stole from Giles helped dilute the power she had gotten from her rage, but it wasn’t magic or superpowers that pulled Willow back from the edge, it was the love of her best friend who wouldn't give up. Xander: First day of kindergarten you cried 'cause you broke the yellow crayon and you were too afraid to tell anyone. You've come pretty far, ending the world, not a terrific notion but the thing is, yeah. I love you. I loved crayon-breaky Willow and I love scary veiny Willow. So if I'm going out, it's here. You wanna kill the world, you start with me. I've earned that. – Christine O. 9. Buffy the Vampire Slayer Season 7 Episode 7, "Conversations with Dead People"
There are plenty of Buffy episodes that I hold near and dear to my heart (like "Earshot" and "Prophecy Girl" to name a few), but "Conversations with Dead People" stands as my favorite. This is a subtle and serene episode that focuses more on the inner thoughts of our characters instead of the big action sequences. Words can be the most powerful thing and it surprises – during the initial watch and every replay – how open and forthcoming Buffy, Dawn and Willow are with dead characters. Throughout the series, Buffy has had ongoing relationship woes and this moment talking to her dead vampire classmate is her chance to analyze her past issues. The same goes with Willow with her fear of magic as she's talking with Cassie, who died episodes prior.